(Drumroll) Ta, ta, ta. 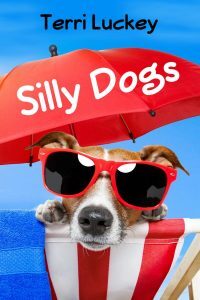 I now have a cover for my newest project…a children’s picture book, called Silly Dogs. I love the new cover. I think it goes well with the inside… a cuteness overload. Silly Dogs will be available soon on Amazon…just in time to have it for Christmas. This is the book description: For every preschooler (and all ages) who love dogs… Silly Dogs will make you smile. Dogs large and small are pictured with a rhyming theme that teaches about the attention dogs require. I’m really thrilled about the upcoming release of Silly Dogs. What better reward for an author than to help to open the eyes of a child to the joy books can provide.